So I recently played through Sunrider, and let me say, amazing game. Wasn't expecting an experience that good and challenging when I saw the game on Steam's "recommended for you" list. I do have a few questions about some of the lore though, namely the warp drive. It is described in game as functioning via "quantum tunneling". Effectively techno-babble for instantaneous travel to distant targets as opposed to the slower alcubierre warp drive (http://en.wikipedia.org/wiki/Alcubierre_drive). I don't know if this was explained on the wiki or elsewhere, but if the Sunrider's (and by extension, most other ships') warp drive can allow it to cross the galaxy "in a matter of days" as Ava describes it, what is the point of "Gateway Worlds" like Far Port? Assuming warp drive allows for instantaneous transit, wouldn't be far more efficient for, say, a merchant to warp directly to his destination as opposed to several shorter jumps past worlds like Far Port? What's stopping the PACT from warpping several fleets from New Eden right onto Solaris's doorstep? I guess what I am asking is what is the limiting factor on warp drive (if any)? Does a ship's warp drive have a flat range that it can accurately jump to and any distance beyond poses a risk or jumping into a hazard, or does warp drive consume a special type of fuel that it consumes with each use, i.e Ongensite? Any answers would be welcome. Does a ship's warp drive have a flat range that it can accurately jump to and any distance beyond poses a risk or jumping into a hazard, or does warp drive consume a special type of fuel that it consumes with each use, i.e Ongensite? Any answers would be welcome. Now that you mention it, shamu will most likely use this as his explanation/excuse. I'd say that it's probably possible to do direct jumps, but they don't because it would dangerous since every path hasn't been mapped out. Think of it this way: if you have 1,000 planets, would it be easier to map a path from every planet to every other planet or would it be easier to map a path between clusters of 50 planets and have a single planet in each cluster have a path to another cluster? The difference in the number of paths is 1,000 * 999 / 2 = 499,500 for the first method compared to (50 * 49 / 2) * 20 + (20 * 19 / 2) = 28300 for the second method. As you can see, it's much easier to do it the second way that the first way. We don't have the specifics (it's technobabble for a reason), but if you remember the storyline, warp drives are very affected by gravity wells of planets, suns, etc to the point they don't work on them. Not only they can't warp from planet to planet, the gravity wells also probably imposes some kind of hard limit: maybe a warp drive works only on a straight line and you can't cross a gravity well. This means that for every gravity well (planet, Sun, etc) in your way you have to de-warp and cross them "manually". This would explain the existence of "gateway" worlds as paths where you can squeeze yourself intead of going system by system. Marx-93, fair and true points. However, while it was stated in game that the warp drive can not function (or is too dangerous to use) close to planetary gravity wells, to include solar gravity wells in this system causes more problems, i.e the matter of crossing a system at sub-light speeds, and where exactly we consider the edge of a solar gravity well. If we include the influence of a solar mass when determining a non-warp-navigable gravity well, and state that any gravity interference will disrupt or otherwise prevent a successful warp, then a ship jumping to a system would be forced out of warp way out in the system's Oort Cloud. 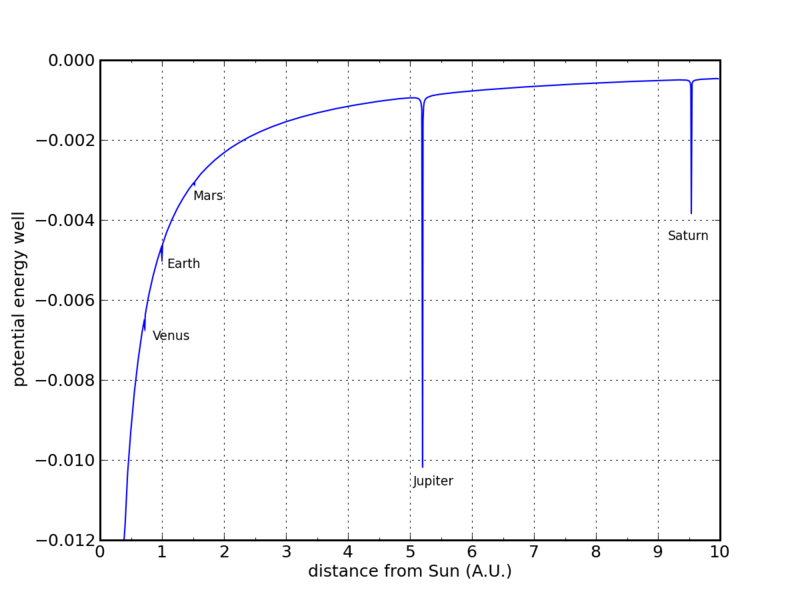 (http://physics.ucsd.edu/do-the-math/wp-content/uploads/2011/10/ss-potl.png) The linked image shows the influence of the sun's gravity well out to the orbit of Saturn (ignore that massive spike from Jupiter). As we can see, the sun's potential energy well extends fairly far out in our own system, and if that's the case, then any ship jumping to another system would have to deal with a lengthy sub-light transit to their destination. It is also possible that I am reading this wrong, and while a ship must exit warp at the edge of a solar gravity well, they can then warp further in-system after calculating a transit path while compensating for the solar gravity well. Perhaps after a fleet exits warp on the system's edge, they need to quickly calculate a path to their target world before said world detects the light from their warp exit. This could explain why during the Battle for Far Port, the cruiser fleets were delayed, as they didn't calculate the intrasystem warp correctly. The effect of gravity wells on the ship is not that extreme: both on Ryuvia Prime and far port, ships were able to warp relatively near the planet, maybe around the distance of a standard satellite to the surface. So the effect of stars would probably be mitigated. Still, your theory is most probably right: needing those corrections would make a lot of sense, specially since in the universe of Sunrider the galaxy doesn't seem fully mapped to every little bit. There are also a lot of stars in the galaxy, so I could see it being a combination of both: Getting extremely close to a planet or star doesn't let you simply travel to everywhere, and if you want to go around it you may need those corrections to warp around the system more safely (even then points extremely close to massive objects would probably be impossible). We may also be missing the point and there may be some kind of hard limit on warp drive. After posting that I remembered a conversation between Ava and the Captain where she said that the Sunrider's warp drive let her travel through the half of the galaxy in a fore-week (or some kind of similar number, I don't remember the details exactly). So maybe warp is not instantaneous and there's some kind of FTL speed. Since FTL speed also means no (standard) relativity, it may also have some strange effects that may explain the seemingly warp effect, like maybe having only an instant pass for the crew of the ship but two hours passing "outside". Looks like a totally reasonable and scientifically plausible option to me. Revontulet [Nov 10, 2016, 05:48:02 pm]: "Babe lets Do the math~ Add a bed, subtract your clothes, divide your legs, and Ill begin to multiply "
Geocorn [Nov 30, 2017, 04:32:50 pm]: Dee trying to post lewds probably. Hah, that's almost as far out as the one in "Brain Teaser" by Tom Godwin. The ship expands around its technobabble core (to like light-years in size) when it enters warp. To move, you inflate the ship, move the core in the direction you want to go, then contract the ship again. The protagonist figures this out when his observations show weird things like the sun being blueshifted while apparently receding into the distance, and the ship seemingly moving in multiple opposing directions at once. Well, as it seems the warping or rather FTL travelling procedure doesn't revolve around dimensional or localized time and space anomalies (we see it's possible to do perform it without recurring to jump gates as in , for example, Freelancer/Star Citizen , and it doesn't imply going to a parallel dimension where the time and space relations with the real universe are not only different, but even change continously like the Warp in WH40k universe), I think of Far Port as a "mapped" highway where you can safely move a whole fleet through performing less jumps and corrections? If the ships really do travel close to the speed of light (or even higher than c, but then the math and physics just kinda rage quit ) , a misscalculation could have some serious consequences, such as appearing at the other corner of the galaxy, at a far later date. And that's without considering anything at that speed colliding against something else. Since the ships are using "warp" in the way that essentially utilizes wormholes (I assume the quantum tunneling is being used as technobabble for a wormhole instead of what it actually is), I doubt traveling at FTL speeds is that much of an issue, timeline wise. It seems to be using the warp drive of the ship to artificially generate a time/space anomaly. As someone who works with actual quantum tunneling, I feel pretty similar. No idea where most people get this stuff. I find it best to just smile, nod, and jump out the window when everyone's looking at something else.